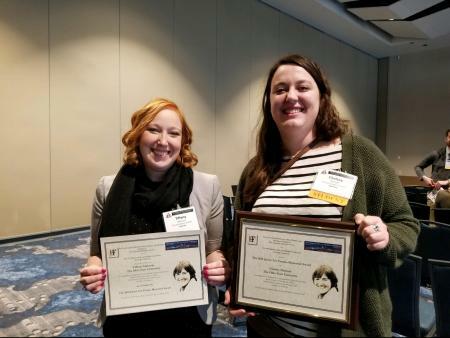 School of Environment and Natural Resources graduate students Chelsey Nieman and Tiffany Atkinson were recognized at the 79th Midwest Fish and Wildlife Conference in Cleveland, Ohio. Chelsey Nieman received The Janice Lee Fenske Memorial Award at the meeting and Tiffany Atkinson was named a finalist for the award. The award recognizes undergraduate and graduate students for their achievements in the field of fisheries or wildlife management. Each year, up to 25 Fenske Memorial Award finalists are selected based on their enthusiasm to protect fisheries and wildlife resources through management activities, selflessness and motivation to teach others, interest in professional involvement, integrity, positive attitude, and compassion. Chelsey and Tiffany are part of Dr. Suzanne Gray’s Lab, which focuses on aquatic physiological ecology and is part of the School of Environment and Natural Resources.